If you are already recruiting from Facebook or planning to do so, you will be accessing as much data and information as possible about how other businesses are doing it. You will be analyzing the trends and your competitors. 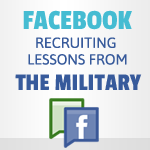 However, there is one organization that you might be overlooking in your Facebook recruiting study: The Military. Military organizations from around the world are using some of the best and effective strategies to recruit from Facebook. Who would have known, right? Think that this is a joke? Well, let’s take a look at some points, shall we? 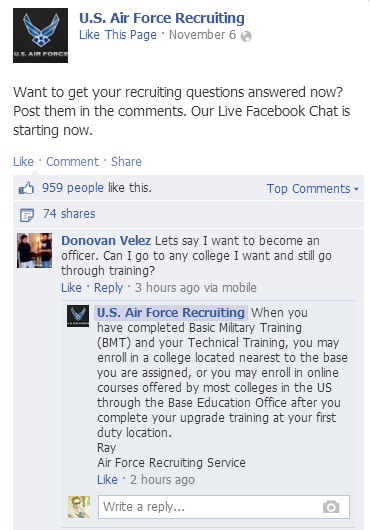 As of this writing the U.S. Air Force’s official Facebook Recruitment Page has garnered over 240,000 likes. They have attained their popularity on Facebook because of the quality of their posts. Their posts are always engaging, interesting, and interactive. The U.S. Air Force always tries to make their posts more transformative than they are transmissive. As opposed to merely trying to provide messages or information in their posts, they allow for interaction and an exchange of ideas. This keeps the page active because the users are constantly participating in the activities in posts. 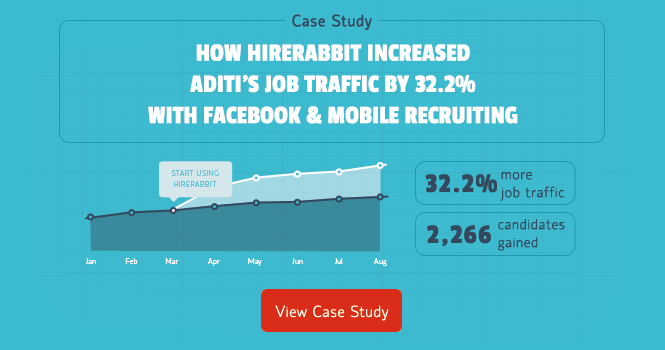 Simple avenues for interaction on your Facebook page can do wonders for your recruitment activity. Try incorporating “Q&A’s” in your Facebook posts or any recurring promos and marketing posts. The U.S. Air Force has a consistent “Throwback Thursday” post on their page as well as “Collaboration” posts and “Trivia Questions” pertaining to knowledge that is required to serve in the Armed Forces. This entices fans to visit their pages more frequently than others. 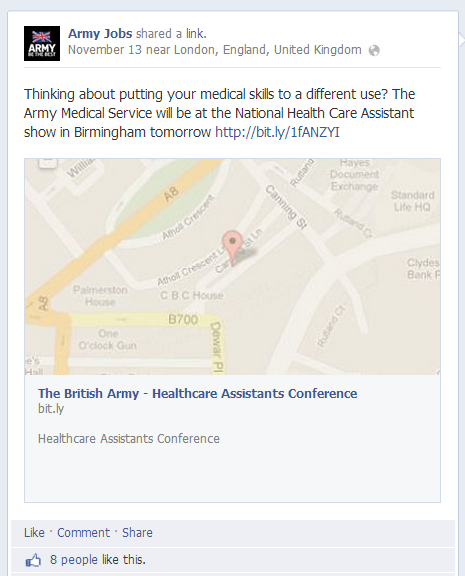 The British Army is a force to be reckoned with when it comes to Facebook recruitment. 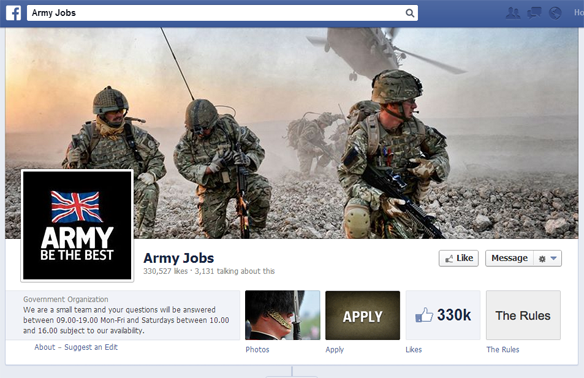 Their official “Army Jobs” recruitment page has garnered more likes than that of the U.S. Air Force Recruitment page. That’s pretty impressive for any organization in the Facebook recruitment scene. 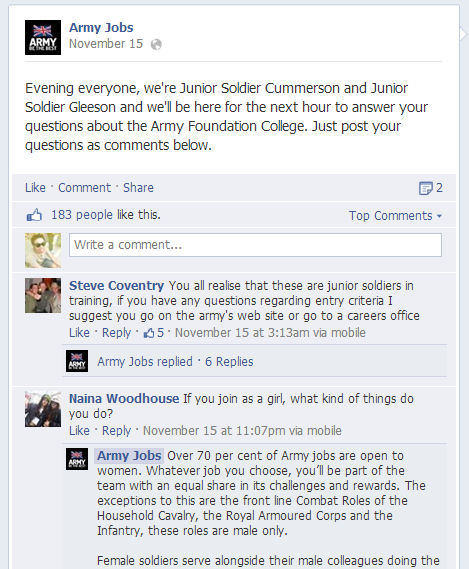 Like the U.S. Air Force, the Army Jobs recruitment page is also very interactive and engaging. With simple posts (see pic below) that merely seek to answer the user’s questions, it generates a lot of activity and visits on the site itself. They also provide announcements regarding events the prospective recruits might be interested in attending. This can be a very useful means of finding the right people for the job. Also, they have masterfully linked most of their Facebook page’s posts to the ones on their website. This is a great way to generate more traffic for your website as well. Multi-platform recruitment is always an advantage. 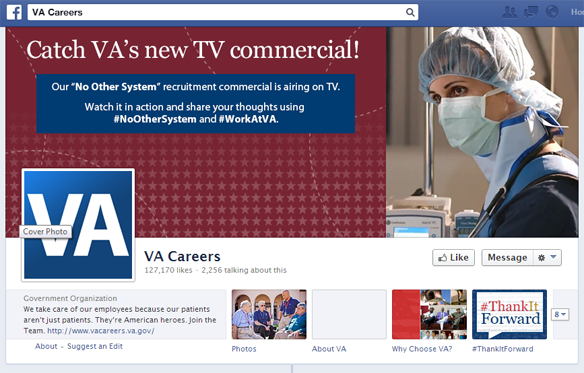 VA Careers isn’t necessarily a military organization, but its thread is definitely cut from the same fabric. Their recruitment activity on social media is also extremely noteworthy. The VA Careers organization is primarily concerned with the care for retired war veterans. Considering their smaller target market, the number of likes on their Facebook Recruitment page won’t be as impressive as the other examples in this post. However, they are still expert recruiters and your company could learn a thing or two from their page. One of the best ways to showcase the strengths and benefits of working for your company is by providing the recruitment pool with a transparent view of what the culture and environment is like in the organization itself. Prospective recruits always feel a sense of ease and security with approaches like this that bare honest accounts of company culture. 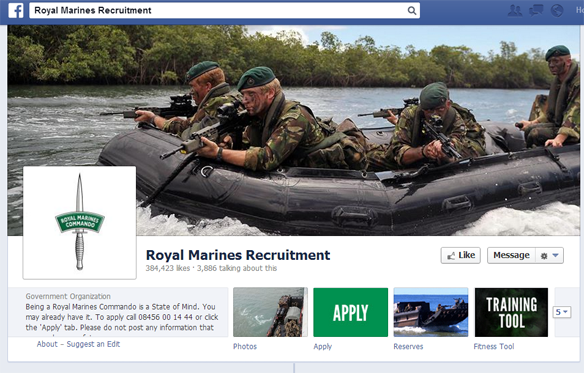 Saving the best for last: The British Royal Marines. 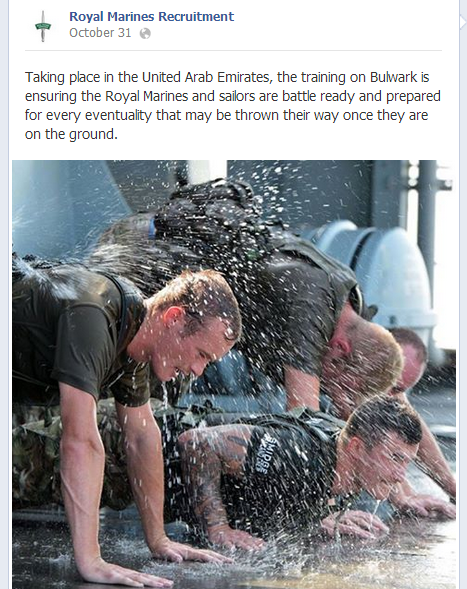 Most can conclude that the British Royal Marines have the absolute best social media recruitment techniques amongst all military organizations. There is high value in their artistic portrayals of photographs and posts. These visual presentations can indeed serve as valuable recruitment tools especially for those who are easily attracted to visual stimulation. Take a look at this post, for example. The excellent photography can certainly catch the attention of anyone’s eye. 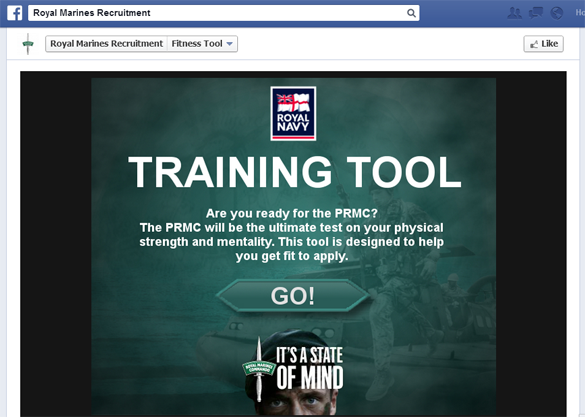 For all those who are fitness buffs, the British Royal Marines Facebook recruitment page has an embedded fitness tool that users can take advantage of. 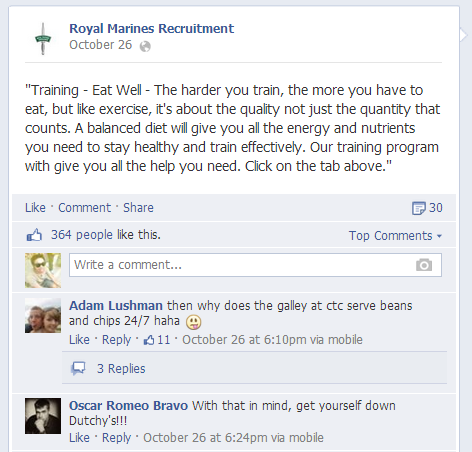 Aside from that, posts regarding health and fitness tips are also a recurring theme in this recruitment page. The variety of content within their Facebook recruitment page is a very good way of attracting a diverse and varied recruitment pool. There is always value in diversity and the Royal Marines realize this and use it to their recruitment advantage. To conclude, if you’re looking to study the recruitment trends of your rival companies to try to find a competitive advantage, try not to forget that the answer you’re looking for can come from the most unlikely of places as well. These military organizations are often overlooked, but they have just as much right to be considered as benchmarks for social media recruitment as well.